I can create dedicated environments for projects and/or clients. My environments will not dependencies installed within them that could implementations between environments. I can save state and come back to something at any time. It is really easy for take a snapshot and then do something risky or install some new flaky software. I had mostly used Virtual PC 2007 SP1 and had become familiar with Virtual Server. When I put on Windows 7 on my machine; I really did not know a couple things had changed. I am not a desktop OS person and I had not read much about Windows 7 – other than I held off from Vista. My goal is to have my host OS on 64 bit with Windows 7 and bring over all my old vhd drives and run them on this machine. You cannot run Virtual VPC 2007 on Windows 7, however the .vhd files created by Virtual VPC 2007 can be used with Windows Virtual PC on Windows 7. It is now called "Windows Virtual PC"
The interface is different from what it used to be. Microsoft is now using it as a strategy to allow every day desktop users use it to get backwards compatibility to applications that work on Windows XP. VHD files can now be mounted (attached) as a disk and then access the files within the VHD directly on the host machine windows explorer. It possible to boot the VHD as a duel boot. Installation is not that hard. First go here and select information about your Windows 7 OS. You will need to minimally download Windows Virtual PC RC. Go ahead and then download Windows XP Mode RC. You can also get all the installation instructions right off this page. System requirements - http://www.microsoft.com/windows/virtual-pc/support/requirements.aspx - Upon reading the system requirements you may note that only Guest Operating Systems of Windows XP, Windows Vista and Windows 7 are only supported. Do not be alarmed, this basically means you will not be able to take full advantage integration between the host OS and guest OS. I can say for the past couple weeks I have been able to bring over several of my VPCs running on Windows Server 2003 with no problem. I know others who have been able to bring over Windows Server 2008. Install the Windows Virtual PC RC. Install Windows XP Mode RC (optional). As I mentioned, the User Interface has changed as it is integrated within Windows Explorer. I am not going to give a tutorial on how to use it however; here is what it looks like. After the installation there will be a new folder called Virtual Machines created which is where you can access and your VPCs. As you can see all of the files and there is a new tool bar being displayed. Taking a close look at the tool bar, when I select a .vmcx (which is equivalent to a .vmc for VPC 2007), you will see an "Open" option added to the tool bar. You can click on that or just double click the .vmcx file which will start up the VPC. You will also notice that there is a "Settings" option in the tool bar when you select a .vmcx file. When you click on Setttings, you will get the traditional VPC Settings screen we are familiar with to configure memory, disk, networking, etc. Finally in the tool bar, there is a "Create virtual machine" button which will launch a wizard to create a new VPC. 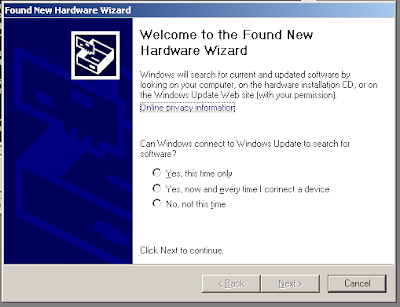 This wizard is again very similar to Virtual VPC 2007. 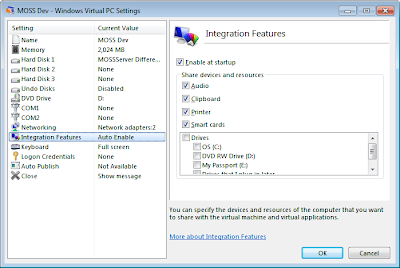 You now see that using VPCs on Windows 7 is more of an integrated experience. 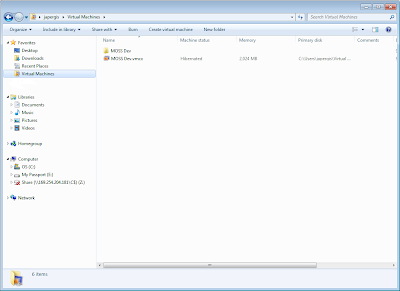 Move the vhd file over to your Windows 7 machine. I suggest that you create a folder under C:\Users\[username]\Virtual Machines\ and place the vhd there. 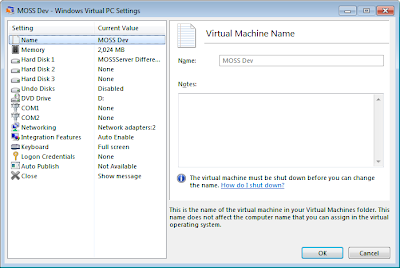 Then go to C:\Users\[username]\Virtual Machines\ directory and click "Create virtual machine". This will initiate a wizard. Specify a name and change the location to point to the location where the vhd file is. Press Next. Specify RAM and press next. On the "Add a virtual hard disk", select the "Use an existing virtual hard disk" and select the vhd file that was moved over. Press the Create button and you are complete. When this is completed, a .vmcx file should be created in C:\Users\[username]\Virtual Machines\. To boot the VPC, all you need to do is double click that file, or select Open button in the tool bar. I suggest verifying the configuration by pressing the Settings button before spinning it up. Here are some things you may run into. 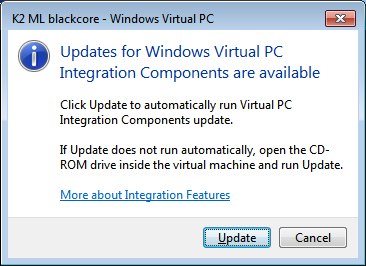 First you will see a pop-up saying "Updates for Windows Virtual PC Integration Components are available" every time you reboot the guest OS. DO NOT press the update button. This will install the integration components for Windows Virtual PC which is not compatible with either Windows Server 2003 or 2008. I tried it; it did not work. Just press the cancel button and you will be fine. Second, you will constantly get a prompt after log in saying New Hardware has been found. Again, just cancel. One thing I have not tried is creating a brand new VPC with Windows Server 2003 or 2008 using Windows Virtual PC. I wonder how the integration between the Host and the Guest will work without installing the additions in the Guest OS; remember you cannot install the Windows Virtual PC additions. I guess the only option would be to run the vhd on a machine which had Virtual VPC 2007 SP1, install the additions, and then bring the vhd back to the Windows 7 machine. Because the integration components do not work with Windows Server 2003 and 2008 on a guest OS, it is not possible to drag and drop files between the host and guest. As well, if you go to the settings of the vmcx file, you will see the Integration Features option. Even if you try to select Drives here, they will not work. Create a loop back adapter on your host machine running Windows Server 2007. Then click on the Networking settings for the vmcx. For the first adapter set it to NAT and for the second adapter select the Microsoft Loopback Adapter you just created on the host machine. Then create a Shared Folder on the guest OS. Then map to that folder of the guest machine from the host machine. Now this is a really cool new feature of virtualization with Windows 7. You now have the ability to treat a vhd file like a drive on the machine. Please read the following - http://thelazyadmin.com/blogs/thelazyadmin/archive/2009/01/15/mount-a-vhd-within-windows-7-server-2008-r2.aspx. However you cannot do this while the vpc is running, so this is not a good open to share files between the host and guest OS if you need to do it on a regular basis. One cool thing is if you do not want to boot up an old vhd to get some files of it, all you need to is mount it. You can go right into the vhd using your host's windows explorer and extract or use any of the files on there. I suspect people will start coming up with really creative ways to use this over the next couple of months. Now this is what many folks are blogging about, it is your ability to do a dual boot from your vhd. Please read here - http://blogs.technet.com/keithcombs/archive/2009/05/22/dual-boot-from-vhd-using-windows-7-and-windows-server-2008-r2.aspx. I have successfully created a VM on Win7 and installed Win Server 2003. The integration services stuff works fine. Interesting. I know I took an existing Server 2003 vhd I had created on VPC 2007 SP1, I removed the additions and then installed the new Windows Virtual PC additions and the vhd would not work anymore. So was this a new vpc you created from scratch on Windows Virtaul PC on Windows 7?